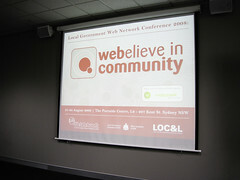 21st and 22nd of August was the very excellent inaugural Local Government Web Network Conference 2008. This conference was aimed at those in Local Government, the public sector, community groups, and non-profits, and other tiers of Government. It was put together by Reem Abdelaty and Diana Mounter, from Local Government and Shires Associations of New South Wales. I really enjoyed the strong sense of community spirit among the 70 (I think it was around 70?) participants. People were eager to chat and share experiences of managing their websites and providing services to their constituents. It was interesting to see the diverse range of roles – some of the participants managed the websites as a full time job, while others balanced the website management along with other duties. John Allsopp – Opening Keynote Speaker: The real and the virtual – closing the circle – John gave an inspirational talk about how the web connects people and devices and the importance of context of use when designing services (rather than web pages). Robert Beerworth – Social Media and Online Marketing – Robert’s key messages included the importance of search and how it should drive decisions, and that planning/strategy is critical to a successful website. James Robertson – Open Source Web Content Management: are we asking the right questions? – James talked about the different types of open sourced and commercial CMS and that commercial or open source isn’t the question – rather it’s about matching a CMS to your specific business needs. Cameron Adams – Working with Design – Cam discussed how web design is about the integration of the look, behaviour and emotion, and provided some design tips to take away. Russ Weakley – Efficient, maintainable, modular CSS – Russ gave another great talk on writing efficient and maintainable CSS. What was new to me was the idea of the bridging CSS files which helps to create hack free CSS – very clever! Web Standards Panel – Russ, Brian and Kate talked about the NSW Style Guide (which seems to be quite the contentious issue among the conference participants, generating lots of discussion around whether they should be a common look and feel across council and shire websites), accessibility and record keeping requirements. Ben Buchanan – Steering the glacier: how does one person have an impact? – Ben gave a great talk about focussing on the things that you can change as well as the importance of coffee in building up and maintaining relationships. Matthew Crozier – Online Community Engagement – what are the benefits and how to manage the risks – Matthew talked about a case study which showed the benefits and risks of online consultation and some of the strategies used to successfully manage these consultations. Local-e Re-Design Project 2008 – Reem Abdelaty and Joanna Lewis took the audience through the user centred design process of redesigning of the Local-e templates. Matthew Hodgson – “The Intranet is dead! Long live the Intranet!” – Using a Doctor Who theme, Matt took the audience on a journey through time where we learned that people were the very first intranets, through to the evolution of intranets today and to the future. Lachlan Hardy – Closing Keynote Speaker: Local Government on the Open Web – Lachlan discussed various open web concepts, including web standards, open specifications (OpenID, MicroID, EAUT etc), and open architectures (API etc), and how this may be applied to local Government. I was particularly fascinated by the OmniTI URLs example – very cool! 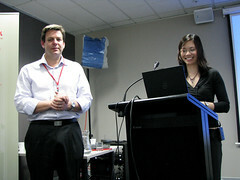 My co-worker (Adrian Newton) and I did a presentation titled Usability for Government: improving service delivery. We talked about usability, why it’s important, some of the user centred design techniques, and tips for people to take away. I had a great time at the conference! Many thanks to Reem and Diana for putting together a great conference, and for the wonderful speaker’s gift (which now means I’m not an Apple virgin any more). To check out what happened at the conference, view the twitter stream and flickr photos. Other presentations should be up on Slideshare over the next few days. 4k2hNu Awesome blog article.Really thank you! Really Cool.